His Excellency Governor Gentiny Ngobila Manama, Governor of Province du Mai-Ndombe in the Republic Democratic of Congo bestowed the title of Princess to Kat Graham. 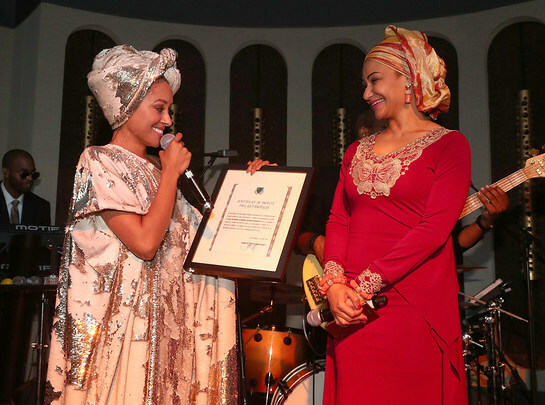 The news was officially delivered by Princess Modupe Ozolua, who also presented Princess Kat Graham with a Certificate of Merit in appreciation of her philanthropic work in the region. Princess Module Ozolua is the founder of the philanthropic foundation, Empower 54. Graham has been an active ambassador for the organization by raising millions of dollars and personally delivering necessary goods and services to the Congo. Empower 54 is a non-profit organization that offers assistance through health, rural development, educational, empowerment initiatives for woman and girls and successful IDP/refugee programs. Graham and her philanthropic partner, Chaka Clarke’s long term vision is becoming a reality by creating a sustainable environment in the province. The Governor has agreed to donate 12.5 acres towards the development of a modern day community for hundreds of orphans in the area. The land is close to the famous Inongo Black Lake in Inongo. The community will have accommodation for the children, schools, kitchens, a skilled acquisition center, private farming lands, a technology village and accommodation for visiting volunteers and much more. Immediately, efforts to renovate schools in the Province du Mai-Ndombe are underway to encourage the children attend school in suitable learning environment. The renovation will include establishing computer labs and the gifting of desktop computers. Solar panel technology will be installed to provide power and electricity for theses initiatives in the rural areas. Graham and Clarke are currently working with individuals and corporations to assist with the delivery of 30 foot containers of medication and nutritional meals to communities where children are suffering from severe acute malnutrition in Province du Mai-Ndombe.